Successfully Added USB LED Lamp with Fan to your Shopping Cart. 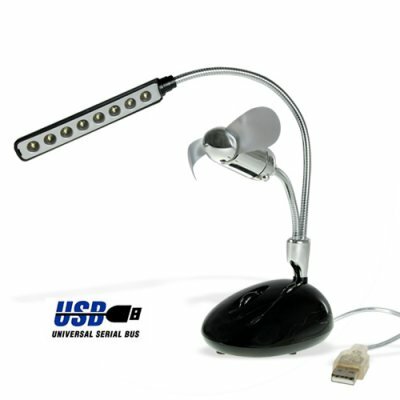 USB powered LED lamp with fan for use on the home or office computer desk. Designed for maximum functionality, this modern desk lamp features a linear array of 8 warm white LED's mounted on a flexible gooseneck arm, allowing you to put the light output exactly where you want it. In addition, there is also a convenient soft blade fan (with separate ON/OFF switch) to help you keep cool during those long workdays ahead. The perfect desktop partner, this USB powered LED lamp with fan comes at a real budget price. Provided in quality retail packaging, we are offering this great new item at a quantity of at least 5 pieces in order to give you the absolute best re-sale profit margin from our low wholesale price and even better shipping rates. Brought to you from the leader in wholesale direct from China electronics, Chinavasion. USB powered LED lamp with fan. Simply plug it into the USB slot of your computer or USB hub. Flexible metal arms allow the LED light fixture and fan to be aimed with exact precision.